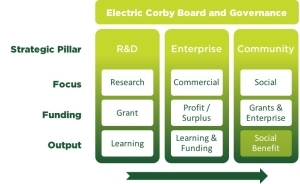 Electric Corby is a not-for-profit Community Interest Company (CIC) formed with the support of the Borough Council. CIC’s are designed for enterprises that have a clear public sector purpose but operate with the independence, flexibility and speed of the commercial sector. We are a private limited company with a mixed private and public sector Board but with an Asset Lock that ensures the assets of the CIC (including any profits or other surpluses generated by our activities) are used for the benefit of the community. Our Board drives the strategic direction and provides governance for the company. The Board has established a “3 Pillar” strategic business for through which we assess and deliver our project activity.